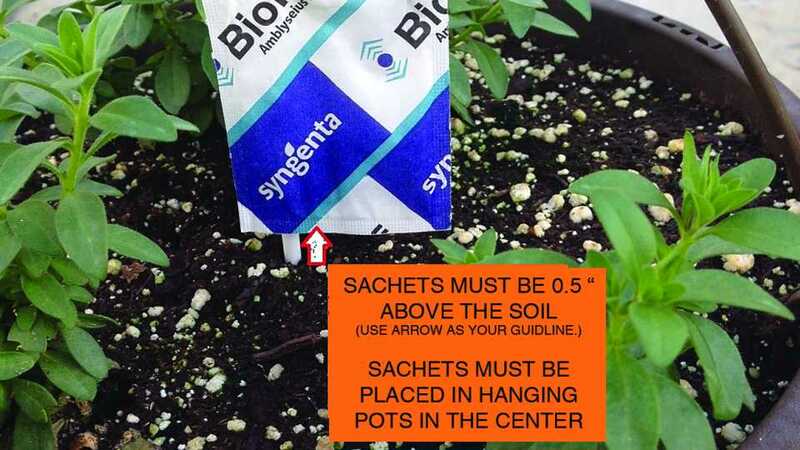 Place sachets in the middle of hanging baskets and position them ½ inch above the soil line for maximum effectiveness. These days, there are a good number of biocontrol suppliers and products on the market. At Metrolina Greenhouses, we receive several offers for different biocontrol products each year. To achieve effective pest control, we have to know which products work and which do not. That is why the company implemented a thorough process to evaluate these products. While Metrolina Greenhouses still uses conventional control products, it also keeps current with biocontrols including beneficial insects, biofungicides, and greener control products. The company decided to trial biocontrols for several reasons. Changing customer expectations led us to step back from several conventional chemistries and replace them with biocontrols. Metrolina has moved to six days per week and 24 hours of operation, so its ability to shut down greenhouses for pesticide application is limited. The company also grows a large portion of its hanging baskets using a system built over shipping and production barns, which further limits chemical applications. The most important step is to determine when to test. Unlike university researchers who inoculate the plant with a pest, we often must rely on natural pest outbreaks occurring in production. These windows of opportunity allow us to test the new product compared to the current practice. When possible, we also leave an untreated control. At Metrolina, we are lucky to have a separate, closed testing facility where we can bring the plants back for treatment and replicate trials to verify the efficacy of the products we test. Testing many of these products on healthy plants is not useful and leaving sick plants in production is also not acceptable. The second step is to decide what to measure. Often, we do simple root ratings and insect counts, along with taking height, width, or fresh mass measurements to compare treatments. We analyze data results using analysis of variance to guarantee that any results we see are statistically true. Statistical analyses require replication, so we collect data from multiple plants. Phytotoxicity to leaves and flowers is also an important consideration. Many times, we test products at one, two, and three times the recommended rate to see if any damage occurs on plants at different stages of development. One particular success story at Metrolina was the evaluation of Amblyseius cucumeris sachets as an alternative to overhead broadcasting of A. cucumeris in gerbera plug production. The sachet is a slow-release system that contains A. cucumeris and a food-source bran mite (Tyrophagus putrescentiae). The question was if applying the sachets would better control western flower thrips (Frankliniella occidentalis) with a lower cost input in comparison to the weekly broadcasts of loose A. cucumeris. We set up a trial comparing two different sources of sachets to our current practice of broadcasting. We used whole 5- by 10-foot rolling tables as treatment areas (30- by 88-plug trays per table, 18 tables per treatment). Every week we placed sticky cards in the middle of the table and conducted 24-hour thrips counts. Early on, there was little difference between the three treatments. Later in the crop cycle, we observed the benefit of using the sachets with lower thrips counts from the sachet treatments. The testing of sachets with the gerbera plugs led to our confidence in using them in other areas of the greenhouse. As mentioned earlier, we grow hanging baskets over public areas that cannot be sprayed. Sachets placed in the middle of the baskets before hanging (Figure 1 in photo gallery) have helped us achieve greater control of western flower thrips (F. occidentalis) and broad mite (Polyphagotarsonemus latus). We are fortunate to have many biocontrol suppliers, but we have to continuously test the quality of their products. That’s why sachets need to be trialed in-house at the beginning, middle, and toward the end of the season to ensure consistency in supply. For that, we use a simple test (Figure 2 in photo gallery), where we place one sachet per sticky card and keep the treatment in the greenhouse environment for six weeks. Each week, we count the number of A. cucumeris released per sachet. The sticky card is replaced right after the count. Another success story is the use of pepper banker plants for outdoor chrysanthemum production. The pepper plants are a breeding ground for the insect predator Orius spp. The banker system allows us to increase the Orius spp. population before placing it in the crop. We have worked on this project for several years. The first year we started with 100 pepper banker plants, which worked well for thrips control. However, we had an aphid infestation that we could not control, and the trial was discarded. The second year we started with 800 plants on 10 acres. We made improvements on timing for the sowing of pepper plants and Orius spp. release. To combat aphids, we added the aphid banker plants system (Figure 3 in photo gallery), which consists of barley plants contaminated with cherry oat aphids (Rhopalosiphum padi) and the beneficial wasp Aphidius colemani. That year, we were able to control aphids and thrips. After the second-year success, we increased banker plants production and application to an additional 15 acres with a total of 2,000 banker plants per 25 acres. In 2018, we used the banker plants system in all outdoor growing areas, totaling of 2,400 plants per 30 acres. We are still on our journey to increase usage of beneficial and biological control agents. Having good partners is critical. The suppliers of biological and beneficial organisms provide great technical support with years of experience. Several of them have helped us set up and trial their programs. Communication and education are the keys to success when using these products. Staff training and following established guidelines for storage and application are crucial. It is also important to have designated personnel who take care of biocontrol in your greenhouse. This guarantees consistency and allows you to build on your successes and learn from your failures. 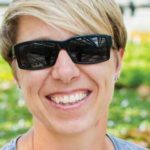 Lida Sladkova is the Trial Manager in Research and Development at Metrolina Greenhouses in Huntersville, NC. See all author stories here.